After her first personal exhibition The Fly Woman in 2005, Amparo Sard (Palma de Mallorca, 1973) – considered one of the most interesting Spanish artists on the contemporary international scene – returns to Salerno with a new display of works (some of which are inedited) from the Sights and Shadows series, created with her original needle point technique, accompanied by a video work named Hauptpunkt. In her new works on paper, Amparo Sard uses a contrast between black and white to communicate the lightness and the restlessness of a “universe” made “of interrupted gestures which are then taken up again” – as Lea Mattarella wrote in a critical work -, “of broken elements in search of a new harmony, of continuously changing shapes.” A universe of visions and shadows in which the artist also “embroiders” herself . 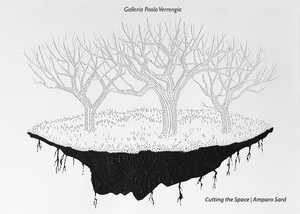 In the two drawings entitled Under the Ground, one of which has been created on a white surface and the other on black, Amparo Sard portrays herself protected and/or imprisoned in a clod of earth, sharing a place with mountains and trees which has been dedicated to them in the illusory space of the work. The video Hauptpunkt (DVD, 7’, 2013) completes the exhibition. With this work the artist affirms the necessity of reclaiming nature through a “contemplative experience” of the landscape: “Today we are living our lives as if we were travelling on a train – says the artist -, with no stops, no seasons, and where everything flows with a predetermined rhythm. Where the important thing is to make a decision quickly and just as quickly correct it, if it is wrong”. Limits. Amparo Sard, edited by Lea Mattarella, Museo MACRO, Rome, Italy; Paisaje Umbrio, Museo Barjola, Gijón, Spain; Gallery BravinLee programs, New York, USA (2015); Limits. Amparo Sard, Stiftung Starke Foundation, Berlin, Germany; Boundarias, Galerie Isa, Mumbai, India (2014); M.A.V. Fundaciòn Pilar y Joan Mirò, Palma de Mallorca, Spain; La Otra, Museo ABC, Madrid, Spain; Paisage Ombrivol, Pollenca Museum, Palma de Mallorca, Spain (2013); SWAB, Galerìa Ferran Cano, Barcellona, Spain; Galerìa N2. Jaume Plensa y Amparo Sard, Barcellona, Spain; La Fugue, Galerie 38, Casablanca, Morocco (2012); Visión: Desafíos. Instituto Cervantes. New México (2011); Galleria Marlborough, Barcellona and Madrid, Spain; El Ángel Exterminador. A room for Contemporary Art, edited by Fernando Castro, Palais des Beaux-Arts (BOZAR), Bruxelles, Belgium; Contemporary Art Museum of Korea, MoCa Seoul; At the Impasse / Amparo Sard, Galerie Voss, Düsseldorf, Germany (2010); Amparo Sard. Impasse. Art works 2004-2009, Casal Solleric, Fundaciò Palma Espai d’Art, Palma de Mallorca, Spain; Royal Ontario Museum, edited by ICC, Toronto, Canada; Galleria Rena Bransten, San Francisco, Usa (2009); Order, Desire, Light. An exhibition of contemporary drawings, Irish Museum of Modern Art, Dublin, Irland; I have a dream, Carriage House, New York, USA; Natuur Historisches Museum Rotterdam, Holand (2008); Take me with you, Museum Mori, Tokyo, Japan (2006). Her works can be found in important private and public collections and in some of the most important International Museums (MOMA - New York, Guggenheim – New York, MACRO – Rome, Casal Solleric – Palma de Mallorca, Contemporary Art Museum of Murcia, ABC Museum – Madrid).